For spring 2017 we have new sets of waterproof jackets and trousers to keep you dry from the weather and spray. The boat we use primarily for our RYA Powerboat 2 course is the Highfield Ocean Master 5.9m. Fitted with a Honda 135hp four stroke engine it is capable of over 30 knots but due to it's aluminium hull construction feels very comfortable even in more challenging sea conditions. Pictured below when we launched her in April 2017. 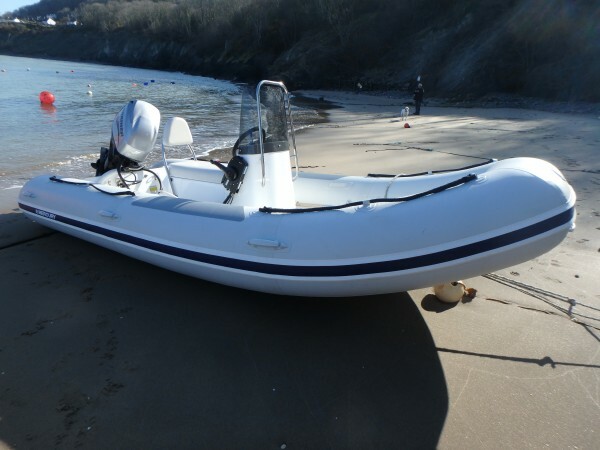 The centre also has a 4.5m Mercury RIB fitted with a 40hp Mariner outboard. This boat is used to support our kayak tours or for coaching the high performance sailing dinghies as it is light and very manouverable. We may also use it for RYA Powerboat 2 courses to give our students a feel for a different boat. Supplied to us by Cambrian Marine she was first launched in 2016. Our fleet of 5 safety boats used by instructors when teaching are Newmatic 360 made by Rigiflex fitted with 15hp Mariner outboards. Shown below with Charles one of our younger helpers. We sometimes use them on our powerboat courses as they are a "tiller" steer boat rather than a wheel. This can be useful if our students will be going on to teaching watersports or safety boat duty. 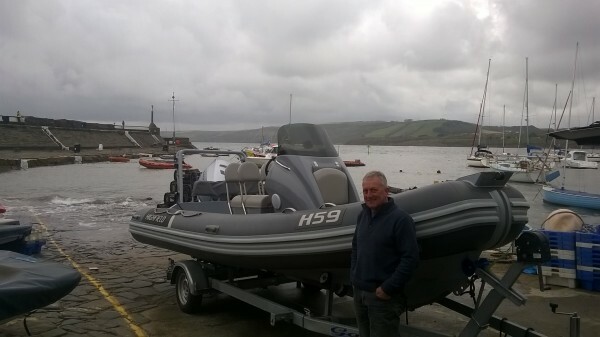 We are happy to recommend our local dealer Cambrian Marine based in Aberaeron who supplied both the Mercury and Newmatic boats. We use them to service our engines too. In this one hour session we will give you an introduction to the basics. You will be under the close supervision of a qualified instructor with the emphasis on fun and safety while you try your hand at slow and fast boat handling. This one day course introduces you to boat handling and safety best practices in powerboats. The minimum age for this powerboat course is 12 years old. On this popular 2 day course you will learn how to launch and recover, high and low speed manoeuvres, "man overboard" recovery and other seamanship skills, complemented by shore based sessions on practical use of charts, tides and currents, weather interpretation etc. We expect that 70-80% of the course time will be on the water. On successful completion of the course you can apply for the International Certificate of Competence (ICC) available through the RYA, which is a requirement of many countries even if only visiting for a holiday. We will need a passport sized photograph of yourself for your certificate. This course is the entry level qualification required by those who wish to work in the marine / watersports industry. Minimum age is 12. To participate in this course you must already hold the RYA Powerboat 2 Certificate. Held over two days the course is a mixture of sessions afloat and ashore covering techniques in recovering and towing capsized dinghies, windsurfers and disabled powerboats. Ideal for those who want to provide watersports safety boat cover. This course is an entry requirement for anyone wishing to become a Senior Instructor. You have done the basic courses and bought your own boat, but you need a guiding hand until you are confident with your new acquisition. Hire one of our instructors by the hour or by the day to provide that support and guidance. understanding and use of charts, tides and currents, weather interpretation etc. Please bring a passport sized photograph of yourself for your certificate. There is some preparatory work to do so if you are planning to do this course book your place at least 10 days prior so we can post joining instructions, pre-work and text book to you. We need a minimum of 3 students to run this course. Course maximum is 8 students. You need to be at least 16 years old. The Course fee is £85 per person. From 1st April 2018 when you have completed the course you apply online to the RYA for your certificate which costs £60.